Presented at the International Meeting on Biology and Conservation of Freshwater Bivalves, 4-7 September 2012, Bragança, Portugal. Also presented to the Freshwater Mollusk Conservation Society, 11-13 March 2013, Guntersville, Alabama. Abstract. Freshwater bivalves are a paraphyletic assemblage of over 15 different bivalve families. This “group” is united not on the basis of common ancestry but by sharing several convergent life history traits adapted to life in freshwater. These convergent life history traits (i.e. restriction to freshwater and parental brooding) are shared by numerous freshwater bivalve lineages including the most specious family the Unionidae (commonly referred to as naiads or freshwater mussels). The Unionidae differ in comparison to other freshwater bivalve lineages (e.g. Sphaeriidae and Cyrenidae) because of their unique phoretic life history that utilizes specialized larvae, called glochidia, to parasitize freshwater fishes. Glochidia and its various morphological types have been important characters in freshwater mussel systematics for over a century and remain a phylogenetically informative criterion at most major taxonomic levels. Despite its demonstrated taxonomic utility, several glochidial morphologies have never been considered in an evolutionary capacity, including asymmetrical glochidia. Asymmetrical glochidia are characterized by having a prominent marginal process on one of the two glochidial valves, dissimilar to all other known glochidial morphologies, which are consistently symmetrical. The genera bearing asymmetrical glochidia (i.e. 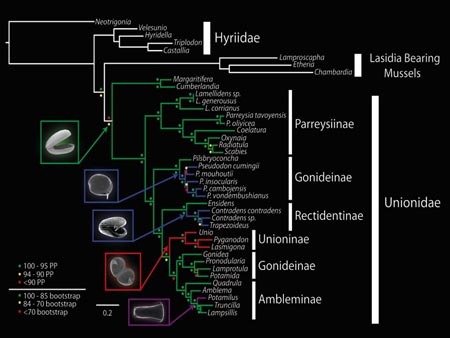 Contradens, Pseudodon, Solenaia, Trapezoideus, and Physunio) are currently classified in two different subfamilies, and the most recent phylogenies are inadequate to determine whether asymmetrical glochidia arose independently in two largely sympatric subfamilies or is a trait that evolved once in a common ancestor of these genera. The objective of this research is to test whether asymmetrical glochidia are products of a single evolutionary event (i.e. are synapomorphic) or an adaptive convergence (i.e. are homoplastic). This research uses a molecular phylogenetic approach that utilizes mitochondrial (CO1, 16S) and nuclear (28S) genes to test the monophly of the genera reported to have asymmetrical glochidia. Tree estimation methods utilized include maximum parsimony, maximum likelihood and Bayesian inference. The results of this research will be discussed in the context of freshwater mussel larval evolution and classification. This slide depicts the rejection of the monophyly of assymetrical glochidia among freshwater mussels. Presented at the annual meeting of the American Malacological Society, 16-21 June 2012, Cherry Hill, New Jersey. Winner of the best student presentation award! Abstract. Freshwater mussels of the family Unionidae have a unique phoretic life history that utilizes specialized larvae, called glochidia, to parasitize freshwater fishes. Glochidia and their various morphological types have been important characters in freshwater mussel systematics for over a century and remain a phylogenetically informative criterion at most major taxonomic levels. Despite its demonstrated taxonomic utility, several glochidial morphologies have never been considered in an evolutionary capacity, including asymmetrical glochidia. Asymmetrical glochidia are characterized by having a prominent marginal process on one of the two glochidial valves, dissimilar to all other know glochidial morphologies, which are consistently symmetrical. The genera bearing asymmetrical glochidia (i.e. 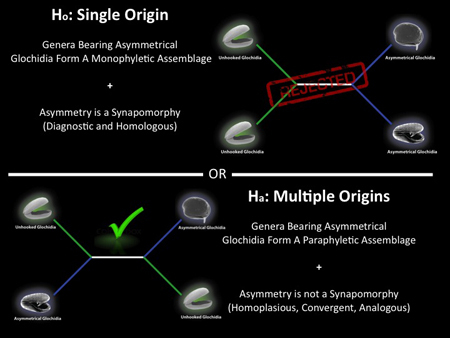 Contradens, Pseudodon, Solenaia, Trapezoideus, and Physunio) are currently classified in two different subfamilies and the most recent phylogenies are inadequate to determine whether asymmetrical glochidia arose independently in two largely sympatric subfamilies or is a trait that evolved once in a common ancestor of these genera. The objective of this research is to test whether asymmetrical glochidia are a product of a single evolutionary event (i.e. synapomorphic) or an adaptive convergence (i.e. homoplastic). This research uses a combined evidence approach that utilizes mitochondrial (CO1, 16S) and nuclear (28S) genes, as well as morphology to test the homology of asymmetrical glochidia. Tree estimation methods utilized include maximum parsimony, maximum likelihood and Bayesian inference. The results of this research will be discussed in the context of freshwater mussel larval evolution and classification. This slide depicts the polyphyly of asymmetrical glochidia on a well-supported molecular phylogeny of the Unionidae. Presented at the annual meeting of the American Malacological Society, 16-21 June 2012, Cherry Hill, New Jersey. Abstract. Eighty species of freshwater mussels once occurred in Illinois and boundary waters. Of those species, 16 are now state endangered (five of which are also federally listed and four are in review), eight are state threatened, 13 are considered extirpated, and five are globally extinct. That leaves only 42 species, or slightly more than half of the historical fauna present in the state, that are not in immediate peril. Which species are able to persist through habitat loss? Which species or groups of species are disappearing? The Illinois Natural History Survey maintains a substantial freshwater mollusk dataset that may help elucidate the timeline of species' loss (or gain) and explain species' persistence. In this presentation, we will showcase data from extensive surveys of mussels across six decades. We will highlight a few Illinois watersheds that provide interesting perspectives regarding distribution patterns and prevalence of at-risk species and compare that to what is happening to the fauna across North America. 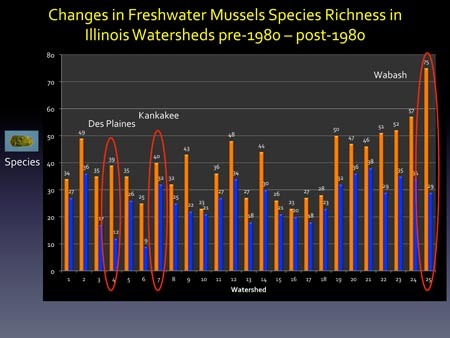 This slide depicts the changes in freshwater mussel species richness in Illinois watersheds before and after 1980.